Yard Waste - Tracy Delta Solid Waste Management, Inc. If any of the above items are placed in the brown yard waste toter, the toter cannot be emptied into the yard waste collection truck. LIDS ON CARTS MUST BE CLOSED COMPLETELY. Place loose yard waste in the brown toter. Please do not use plastic bags. Do not tie branches and limbs or pack the waste into the toter. Every other week, on your garbage pick up day, set the brown toter out at the curb by 4:00 a.m. It’s a good idea to set toters out the night before pick-up. Please do not set out any extra material that will not fit into the toter with the lid closed. 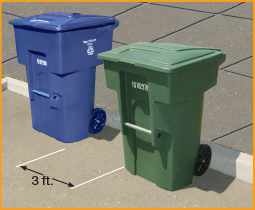 Yard waste collection will be fully automated, therefore, we will only collect yard waste which is placed in the brown toter with the lid closed. Over-flow material will not be picked up. Please save extra yard waste for the next pick up. If you have an extra large lot, you may need an additional brown toter in the Spring and Summer. Carts must have 3 feet clearance on all sides. Carts must be 6 feet from vehicles, boats & trailers.